The adduction of DNA is believed to represent the initiating step in chemical carcinogenesis. Our laboratory seeks to understand how, when bonded to DNA, various chemical carcinogens perturb DNA. The longer range goal is to understand the basis whereby chemical modification of DNA triggers specific mutations. Some mutations, especially those occurring in proto-oncogene sequences or tumor suppressor gene sequences, play crucial roles in the process of carcinogenesis. Some fundamental questions under study are: How do the solution structure and properties such as thermodynamic stability and rates of base pair opening change upon adduction? What is the role of DNA sequence in the properties of adducts? How does adduction affect the ability of DNA to form higher order structures? High field NMR spectroscopy plays a major role in this research program, aimed at delineating molecular conformation and dynamics. 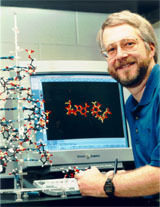 Our laboratory is a major user of the Vanderbilt Biomolecular NMR Center, which is operated by the Vanderbilt Center for Structural Biology. Observation of nuclear Overhauser enhancements (NOEs) between carcinogen protons and oligonucleotide protons demonstrates spatial proximity, since there exists an inverse sixth power dependence upon the separation of the nuclei involved. Chemical shift, J coupling, and T1 and T2 relaxation data are also monitored. Structures are refined using calculations restrained by experimental data. Back-calculation of theoretical spectra from calculated structures measures the accuracies of the refined structures.